Tipis can accommodate up to 5 – 6 persons. The tipi area has real north American Indian imported tipis. Inside the tipi is a covered raised wooden floor: floor mattresses are supplied for each person. Small 12 volt light bulb in each tipi for night time illumination. Please note there is a minimum of 2 adults stay tariff applicable in the high season. Cabanitas are small wooden huts just for two, a couple or two friends sharing: there is no room for a third person or child. They measure 3 meters x 3 meters and have 2 single beds inside and a light. A table and 2 chairs are provided for sitting outside and own fridge. The barrel is a rounded structure with steel tightening bands. 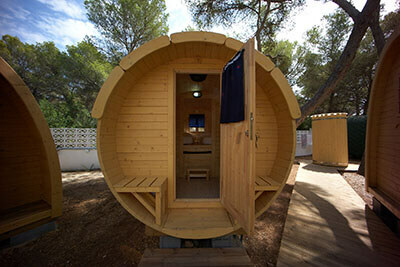 Inside the barrel a slightly elevated area is sleeping space for 2 persons (2 x 2 meters). There is a door with lock and hexagon window, and an opening window in the back wall. There is a sitting space with 2 benches and a sliding fold away table. Small benches at the entrance. Small fridge and fan. 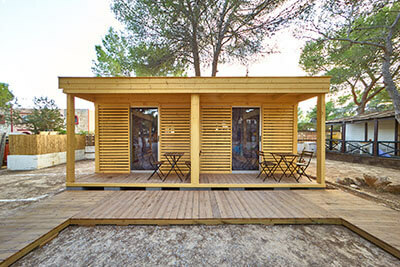 The pods are made of wood and the roof is covered with green bitumen shingles. Double doors with a lock and double glass windows. Opening window in the back wall. Sleeping room with 2 single beds. 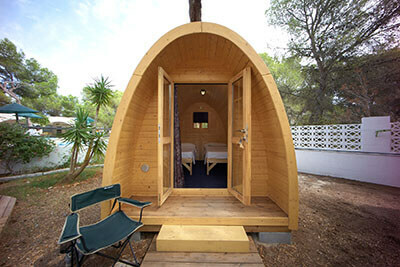 The larger pod has the sleeping room with 2 single beds and extra space with a table and wooden bench, which can be used as a small extra bed, for a child or slim adolescent/adult. Small fridge and fan. 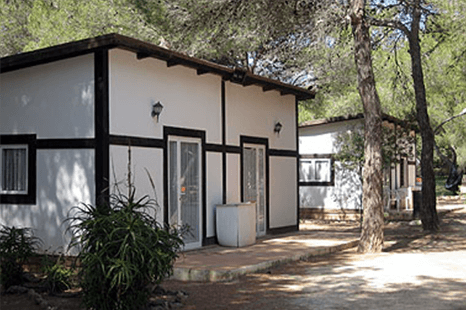 Chalets are ideal for families or groups of 3, 4 or 5 persons. Built of wood they measure 5 meters by 5 meters. Inside they are open-plan with no dividing doors, but curtain or panel divisioning. 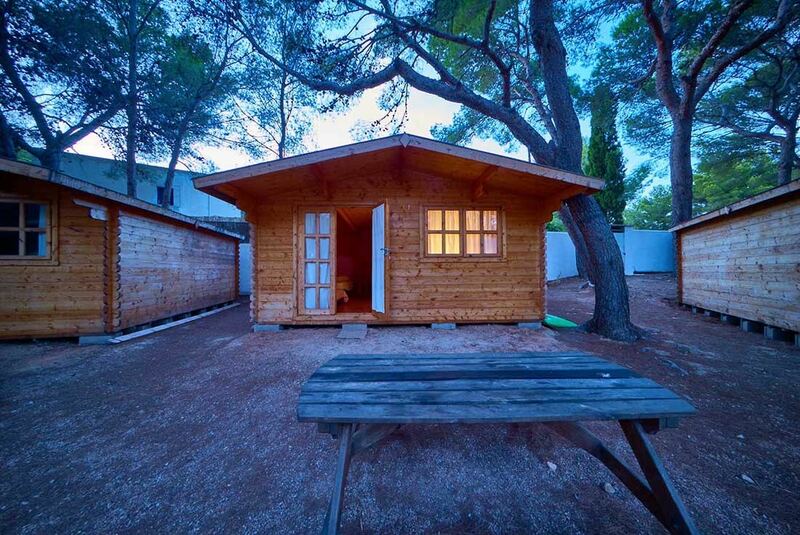 Equipped with a fridge and basic cooking equipment for use in the communal kitchen area. 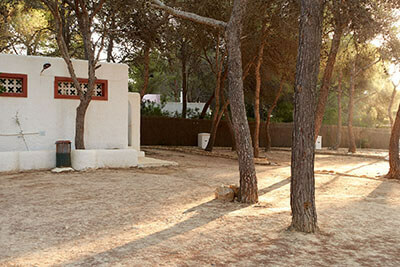 The communal shower and toilet block are a few meters away. 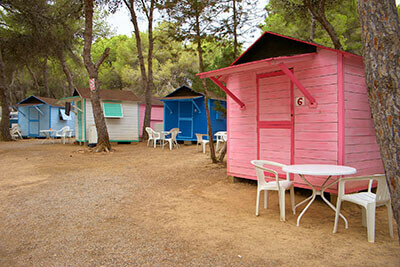 The chalets are not connected to water supply. Each chalet has a trestle table and bench outside. Family bungalow accommodating up to 5 persons. 2 bedrooms with 2 single beds in each room. Living room with a sofa bed and corner kitchenette with basic cooking utensils. No microwave. Small basic bathroom. Terrace with table and chairs. Extra charge for bed linen hire and cleaning on departure.